This cool, wet “summer” has been fabulous for our slug and snail chums. And I’ve learnt that I’m really good at something. (What a relief that is). I’m simply brilliant at feeding slugs. 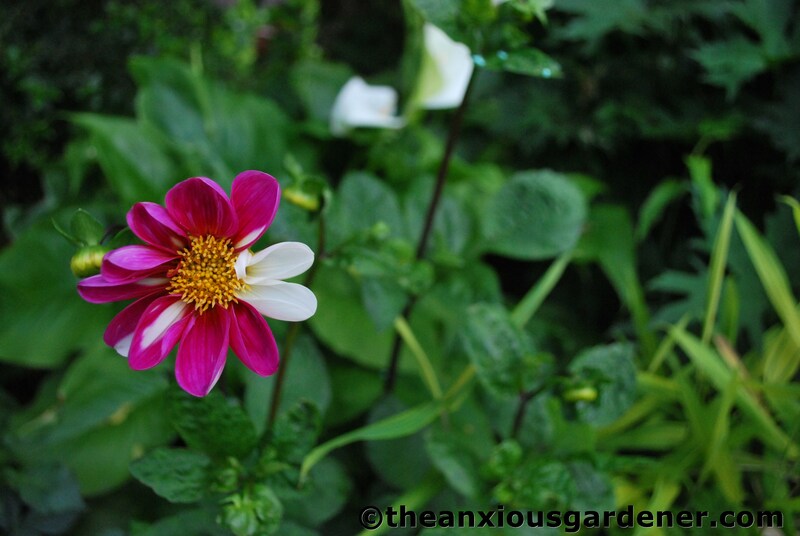 … dahlias have proven particularly popular. Though I skip about the gardens scattering (organic) pellets to my left and to my right, it makes little difference. The following morning all the pellets will have disappeared and the devastation will have continued. So no, this hasn’t been a great year for gardening; too little rain, too much rain; sloppy soil, baked-hard soil: buffeting winds and pro-longed periods of cold. And those sluggy, snaily things. One might even say it has been a rubbish gardening year. So I shall. It has been a rubbish gardening year. 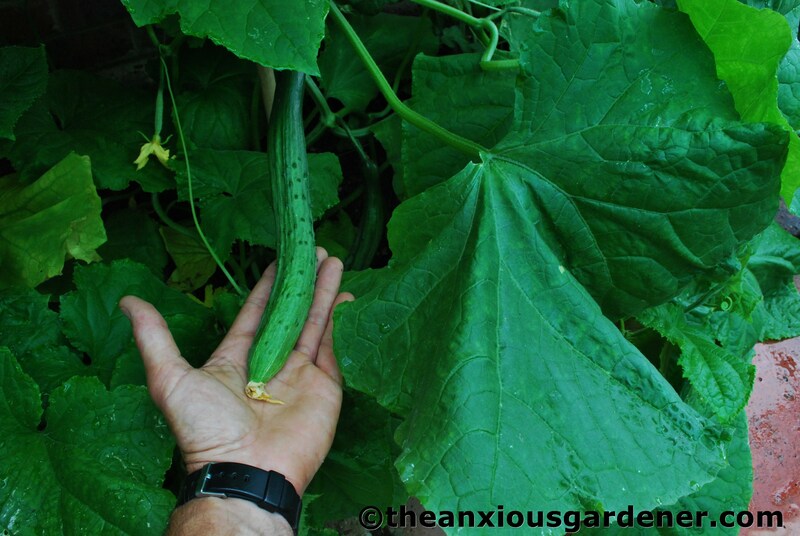 … and it won’t be long before we have our first cucumbers. 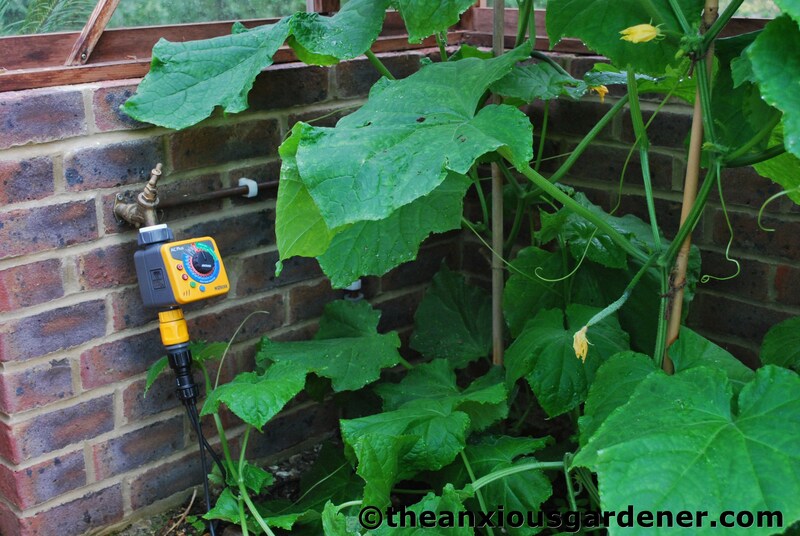 I’ve bought an irrigation system for these bed-grown plants and it seems to work fine; watering away over the weekends. 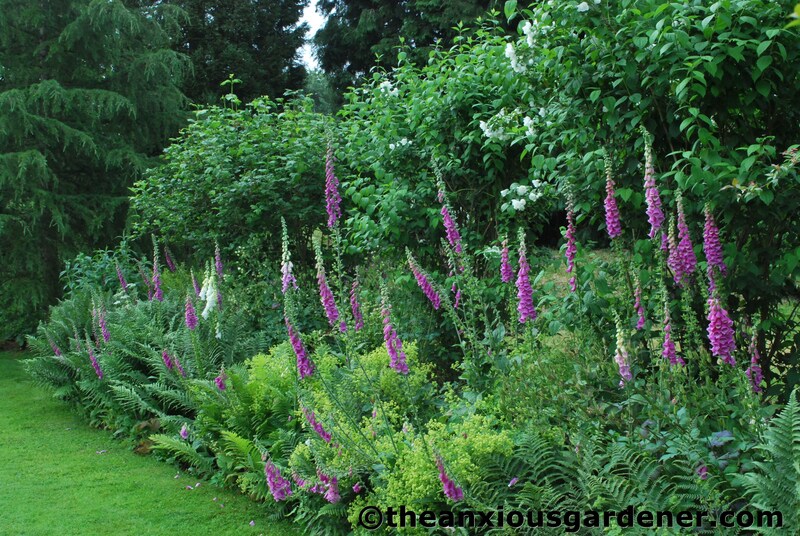 In the rock border, the foxgloves are showing off nicely. Each year I dig up self-sown seedlings, pot them up and then dot them about, aiding their further colonisation of the gardens. In addition, I grow white ones from seed. 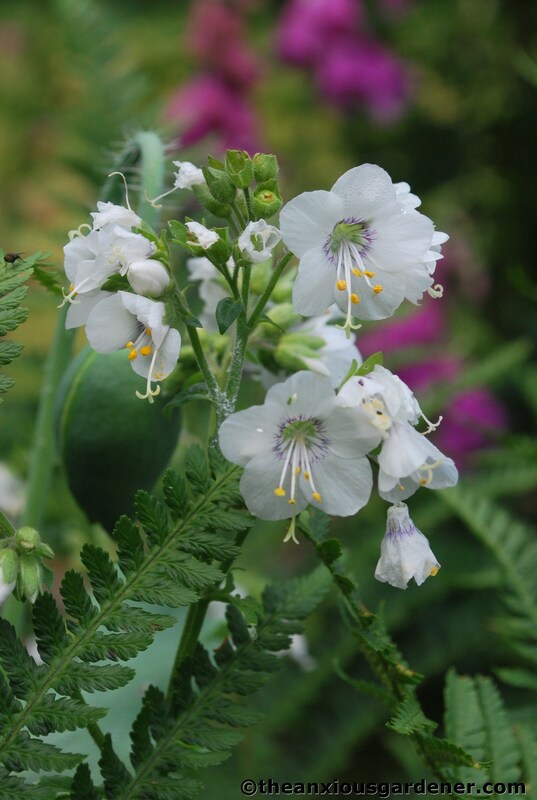 …are the same and unlike some varieties I grow (‘Fire and Ice’ springs to mind) this is a resilient, vigorous plant. 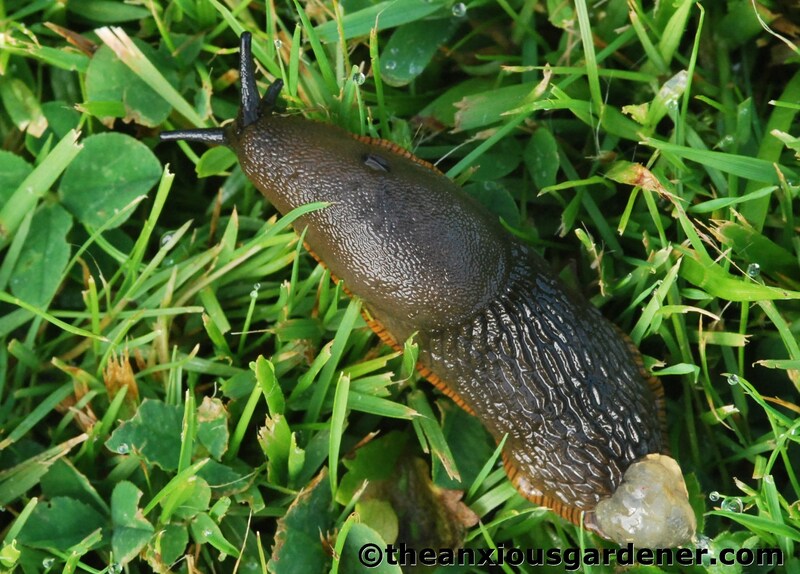 (Slugs often ‘go’ for weaker or poorly, less robust plants). Also in the rock border, amongst the ferns, I’ve discovered polemoniums. Never seen it before; never grown it; never bought any seed. Its seed must have lain dormant in the soil. Waiting. Just waiting. Either that or there’s a guerilla gardener about! 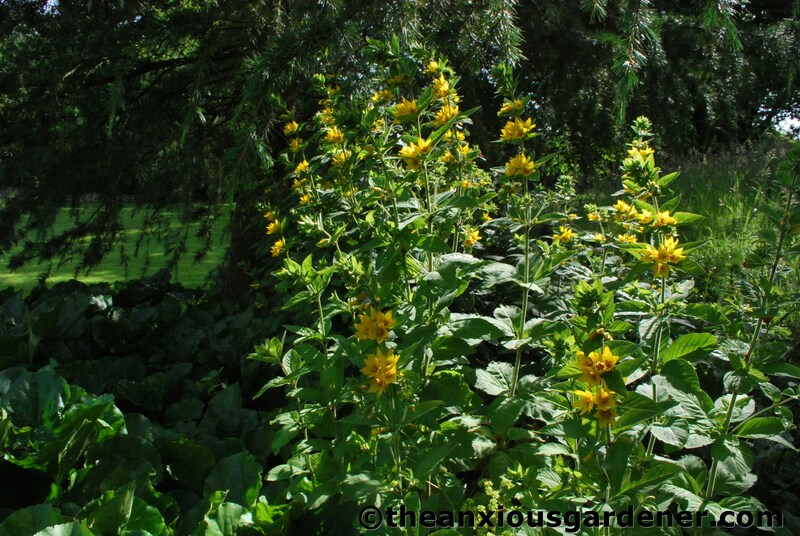 At the rock border’s far end, and increasing year on year, is a clump of yellow loosestrife (Lysimachia punctata). 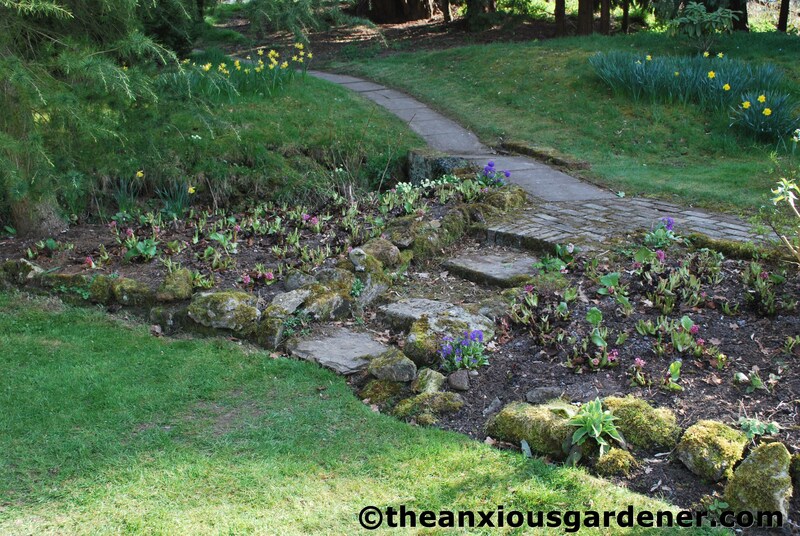 To the left of it is bergenia – which I moved here from another part of the garden. Incidentally, I always cut off all the bergenia leaves in spring; this removes all the tatty, browned ones. 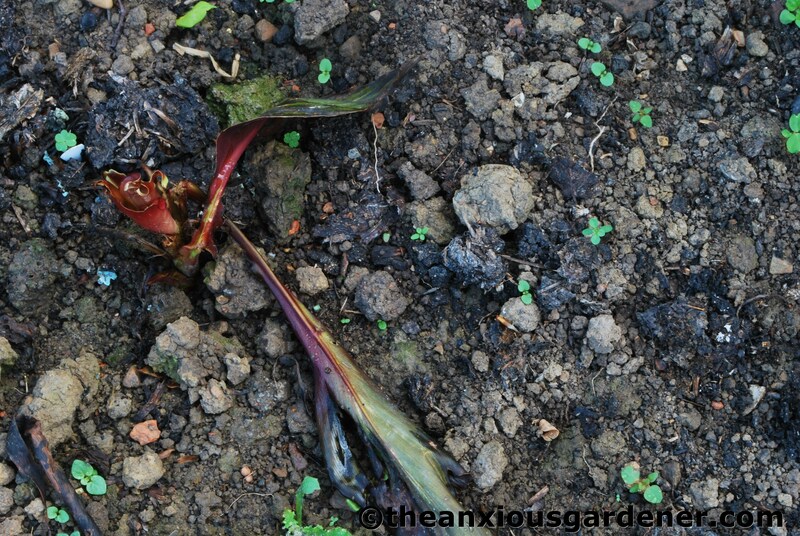 This was the bergenia de-frocked in April; looks a little startling but the new, fresh leaves soon emerge. In one of the kidney beds, my Crambe cordifoila has flowered again. 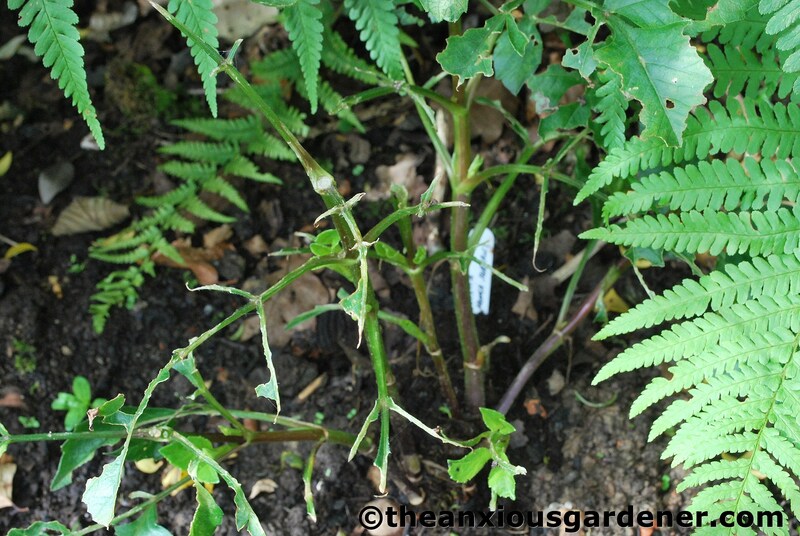 Last year the stems collapsed, so this year I’ve given it a damn good staking – and it is holding up. 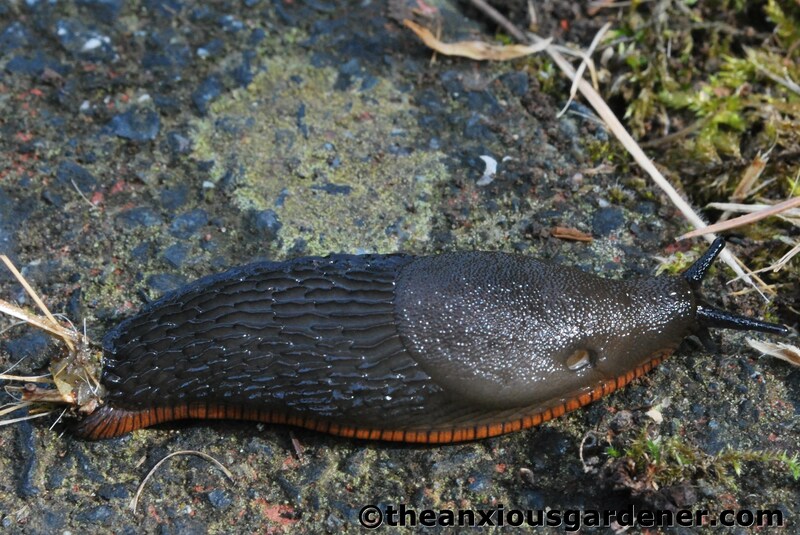 Oddly, the slugs don’t seem to bother it. 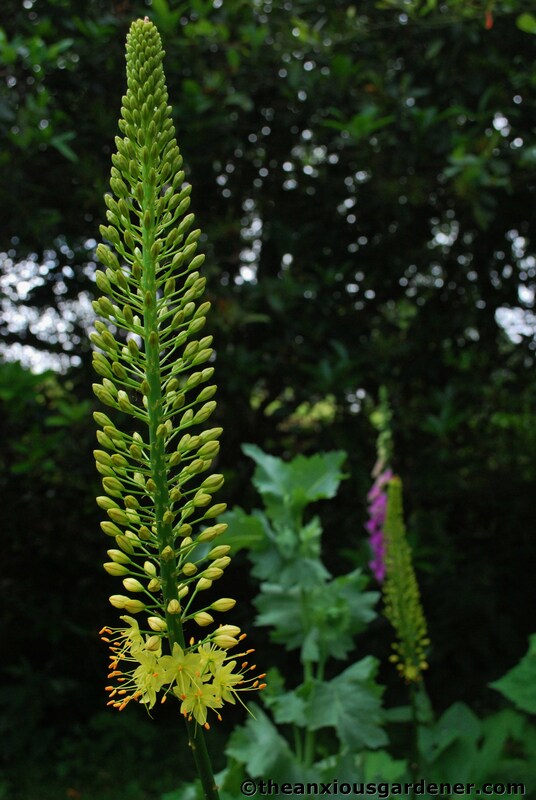 At the back of the kidney beds are Foxtail Lilies (Eremurus stenophyllus). I’m hugely pleased with these – the first I’ve ever grown. But they were prone to slug attack too and from ten bulbs, only two or three have flowered. Hopefully they will do better next year. 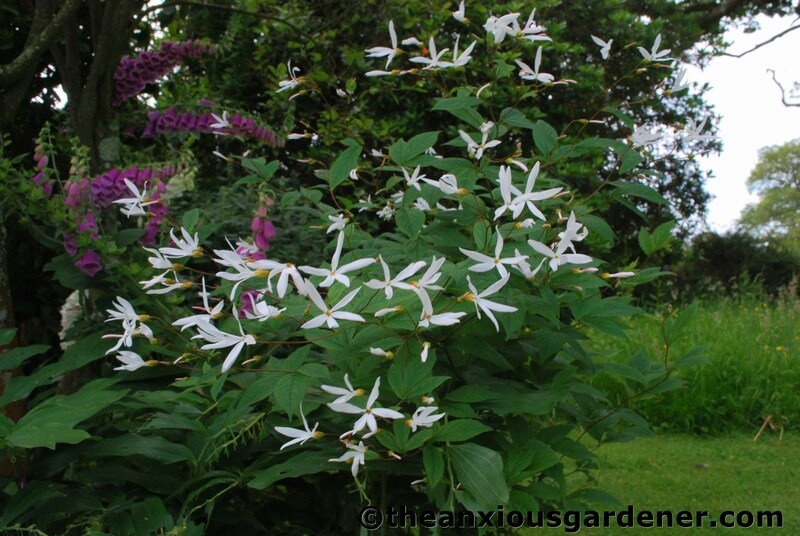 Also in one of the kidney beds is a lovely, understated plant: Gillenia trifoliata. This pretty, little thing is one of the very few plants I took from my old garden when I moved house. It doesn’t seem to be widely known or grown. It ought to be both, I think. 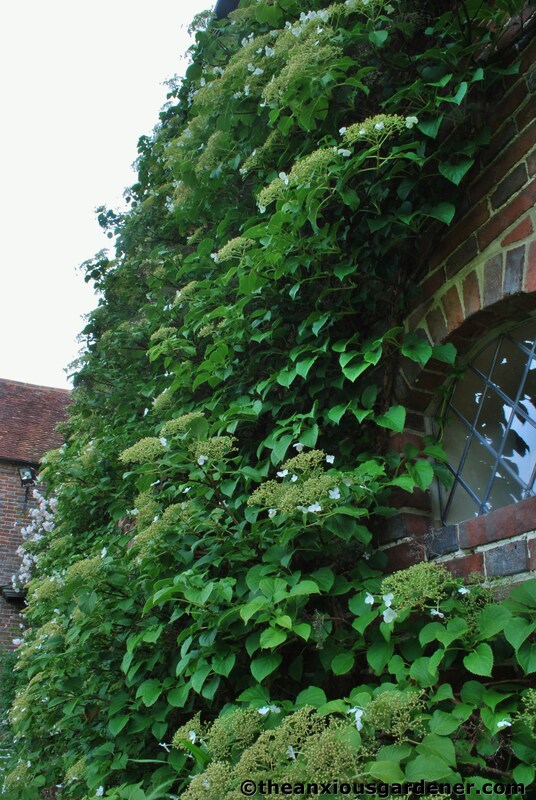 On the west wall of the house is a marvellous (and huge) climbing hydrangea (Hydrangea petiolaris). Last year all the flower bud was lost to frost. This photo, taken a bit too late, doesn’t do it justice – the display this year was a good one. 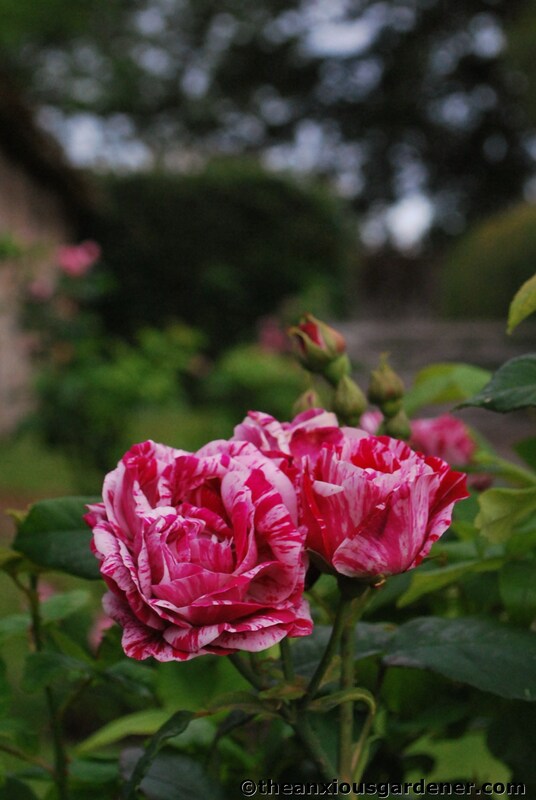 … and in the car-park, four Rosa ‘Ferdinand Pichard’ are getting established. Planted bare-rooted a couple of years ago, they also have a superb scent. 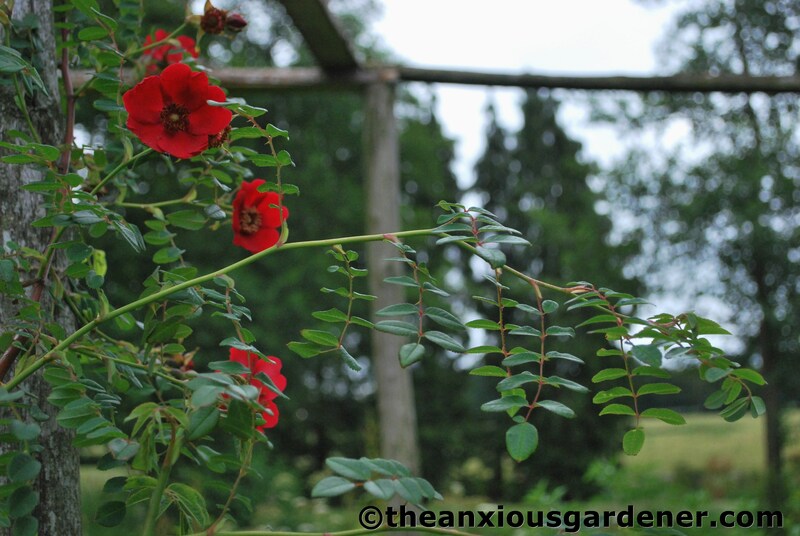 On the rose tunnel, and flowering for the first time, is Rosa moyesii ‘Geranium.’ No scent but a beautiful, simple flower which later form large brilliant orange, flagon-shaped hips. (Thanks to Francie for introducing me to it). 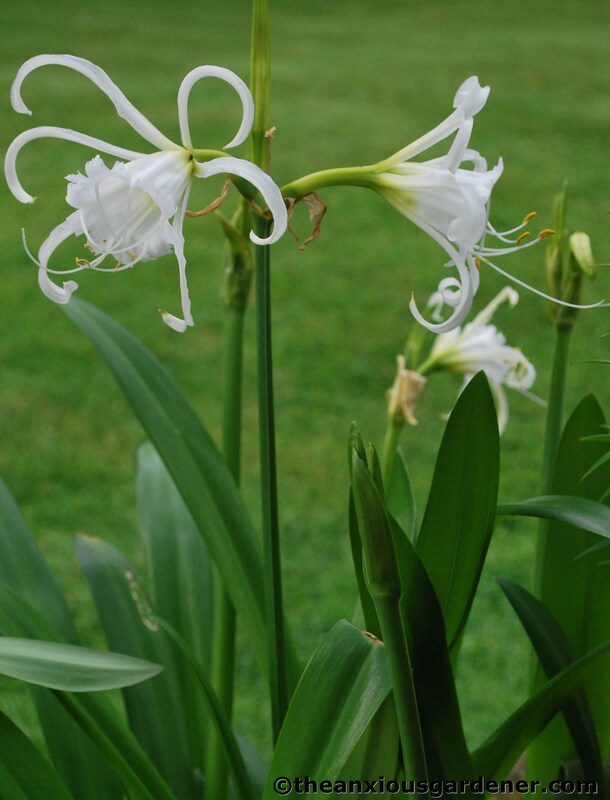 And finally, another plant which I haven’t grown before (put in a pot to protect it from slug-dom); the exotic looking Peruvian Daffodil, the Spider Lily or Ismene (Hymenocallis x festalis). Rather lovely, don’t you think? So, despite the best efforts of all those blasted gastropod molluscs, there is some flower in the Priory gardens. With, I hope, lots more to come. Beautiful plants! Over here it has been a good year for my garden with snails and slugs, I don’t know why since we had a rather rainy and cool spring but few of those sticky crawlers. I can confirm the old rose is a new dawn, the first thing I thought when I saw the picture and before reading your words was ‘what a nice new dawn!’. It is one of my favorite roses. Commisterations. Our lupins have been decimated by snails even though I’ve fed some of the offenders to the chickens. Thankfully the bishop of Llandaff is doing well so far and the other dahlias seem fine, too, but I think I’d better just check on them in the next few days. The French marigolds I planted recently have all but disappeared. It is a very bad year for slugs and snails, and I saw a rat run across the patio for the very first time the other day. 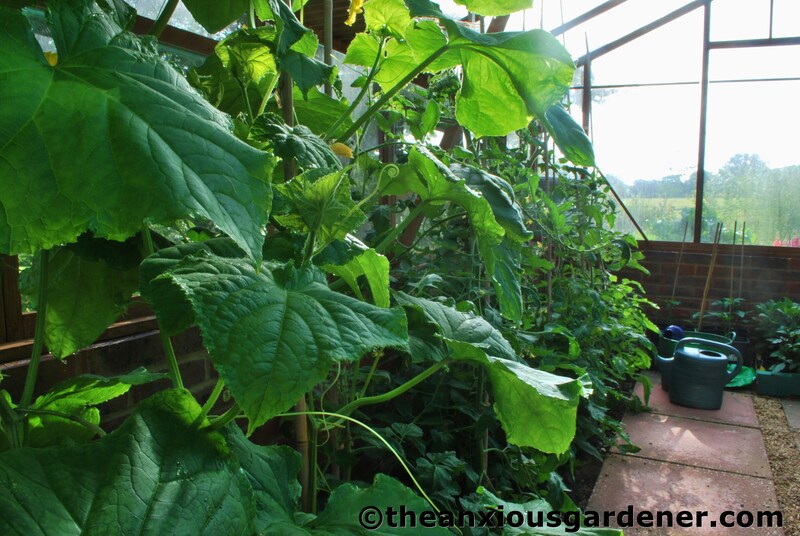 We need some warm dry summer days, with a bit of rain in between to keep the plants alive. Hi David, that’s a really unique way to start a blog, with slugs! 🙂 Mind you, even with those slimy critters you managed to take nice photos of them. The garden is looking great, and so many lovely and colourful blooms. Good tip on cutting back the bergenia leaves in April, must do that to ours so you all fresh new leaves in the summer. And yes, that Spider Lily is lovely! Love the Gillenia – really ethereal looking. That bright pink/lime green combo of the foxgloves and alchemilla is a great one. It’s a sad fact of life that organic slug pellets are worse then useless. It’s also a fact that if you want to protect particular plants, your only hope is the blue ones. The only other reliable slug destroyer is the hedgehog, but you can’t buy them in the necessary quantities…. Since it’s always wet in Scotland, I always have running battles with slugs, and you can take it from me that every remedy other than outright chemical warfare is doomed to failure…. We’re generally immune to slugs out here, for which I am very, very grateful. They certainly put the black widow spiders in perspective. Better the risk of a trip to the hospital than the guarantee of all that plant damage! (Seriously!) 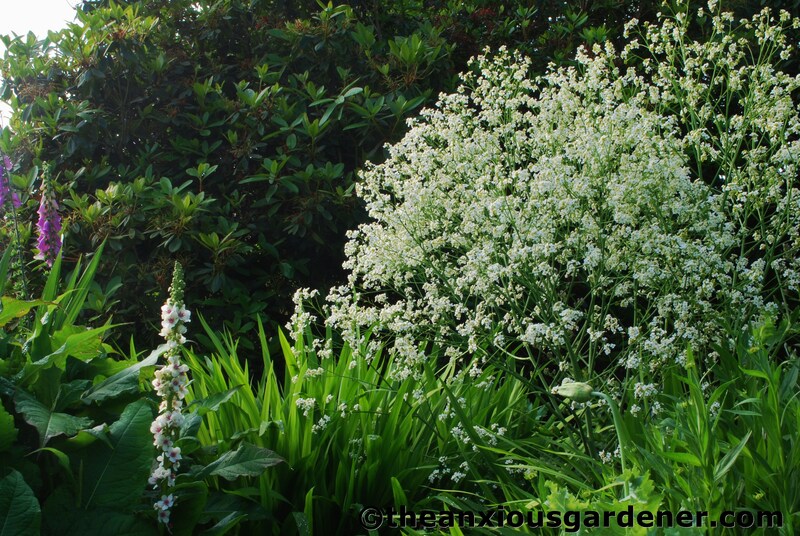 Frothy white flowers are so lovely in summer — glad to see your Crambe is doing well this year, and the Gillenia is beautiful. I just looked it up and read a description as “gaura for shade” which sounds about ideal. How long has it taken your Hydrangea petiolaris to reach that height? I planted one on the North facing wall of our house…it has only grown about 2 feet in 6 years. Hi Bridget. Something is wrong. H.petiolaris should grow two feet every year, and more if it gets its roots into your drains (not something to wish for). North-facing is fine, so could it be too dry? Should have bought shares in a slug pellet company this year. I’m just off to the plot to scatter more around my newly planted beetroot and peas. Still I suppose I haven’t had to do any watering so every cloud and all that….mmm maybe shouldn’t have used cloud analogy, too many clouds this year as it is. Wellyman once did a trial with some copper wire and various slug ‘guinea pigs’ to see if it did actually repel them. This was pre OU degree days when he clearly had too much time on his hands. Anyway they crawled all over it, it didn’t seem to put them off at all. It wasn’t the most scientific of trials I’ll grant you but ever since I’ve been a bit dubious about the effectiveness of copper. Some amazing flowers you have here, despite the marauders. I love your Peruvian Daffodil, the Gillenia – never seen these before, your climbing Hydrangea, and of course, those magnificent roses. Erk……. your breeding some pretty big slugs there!! now what you need to do is have a big party with beer lovers and then leave some half empty cans hidden around the garden……………..
Again…I’m just off to bed now with a vision of you skipping about scattering pellets hither n’ tither. Maybe that’s where you’re going wrong, you need to throw something a tad heavier to kill the lil’ blighters…a house brick or 3 maybe! 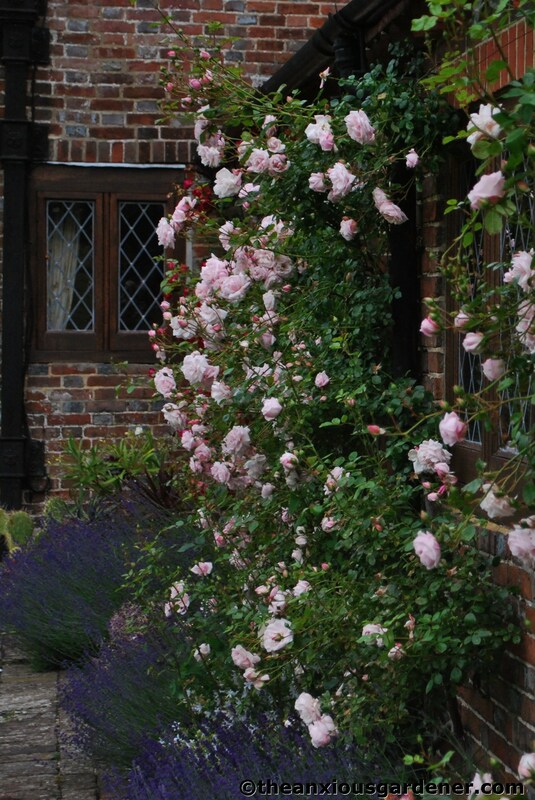 Meanwhile the garden is looking splendid ol’ chap…lots of gorgeousness to die for. I’m getting absolutely tortured with the slimy menace at the moment. Entire batches of seedlings hoovered up overnight, I’ve just taken delivery of a batch of nematodes which I’m going to apply this weekend, so fingers crossed. I hate to say it, but I have read so many times that slug pellets attract slugs and snails from near and far. In the veggie garden I manage to protect my beans and sweet corn with cut off lemonade bottles which have copper tape wrapped round them, gives them little electric shocks so they go somewhere else, or that is the idea! I haven’t heard that re pellets, Pauline. 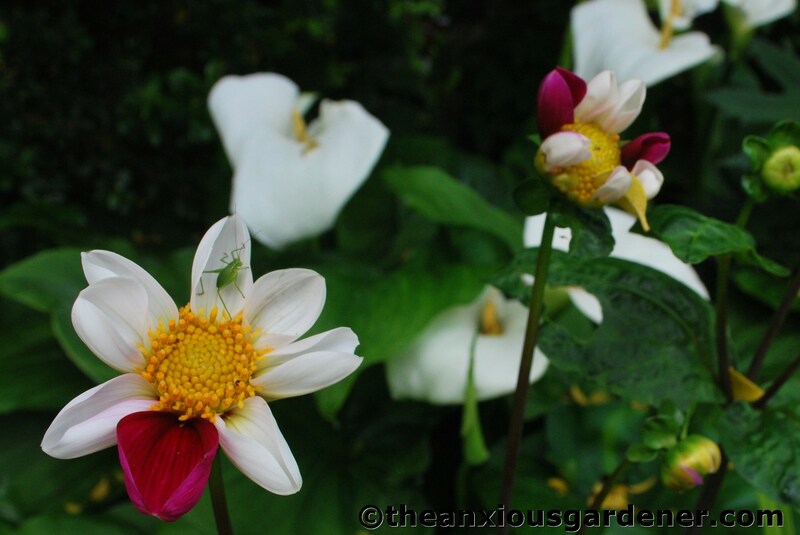 I have found that in the past, the pellets have worked; they seem to stave off attack until dahlias, for example, are big enough that slugs don’t bother them. It is just this year that they have failed me; the weather seems too perfect for slug breeding. You are right this year has been a slug version of Nightmare on Elm Street. For the first time ever I have no dahlias in the garden – all that careful saving overwinter – came to naught. Are we downhearted – yes we are! The flowers of yours that have survived are gorgeous especially the Gillenia, which I have never heard of – it looks like lots of little fairies dancing about (well, I do have a vivid imagination). and ants I keep finding ants nests. Cut the grass and lo behold an ants nest and the grass wasnt that long, moved a tray of pots and yes another ants nest. I also found my dark leaves dahlias have been attached less than the general green ones which are shredded and to be honest on the compost heap now.